Baking potatoes whole so that they have a slightly crisp or dry exterior with a moist, steam-filled center is [simple] (http://www.seriouseats.com/recipes/2007/11/the-perfect-baked-potato-recipe.html), but they can take a long time to cook. Using the microwave to “bake” your potatoes produces a similar result in significantly less time. The perfect microwave potato requires the right potato and attention to cooking time. Russet potatoes are the classic choice for baked potatoes because of their large size and high starch content. While you can use any type of potato for baked potatoes, the higher the starch content, the fluffier the end result will be. You may use white or blue potatoes for baking, but avoid red potatoes or Yukon Golds, as these contain less overall starch. In all cases, choose potatoes that are firm and with no visible blemishes. Scrub the potatoes thoroughly to remove dirt on the skin. Pat them dry to remove excess moisture, then stab each one multiple times with the tines of a fork. Stab deeply, pushing your tines at least halfway in. The larger the potato, the more holes you need to allow moisture to vent during cooking. This minimizes the chances of a potato exploding in the microwave. Rub the potatoes with olive oil and sprinkle with salt, if you like. 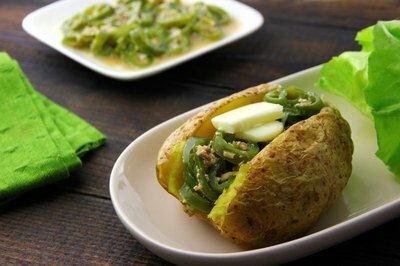 Place the prepared potato on a microwave-safe dish and cook it on high for five minutes. Turn the potato so that the bottom side faces up, and if your microwave doesn't have a rotating base, turn it so the side facing the inside of the dish is now pointed toward the outside. 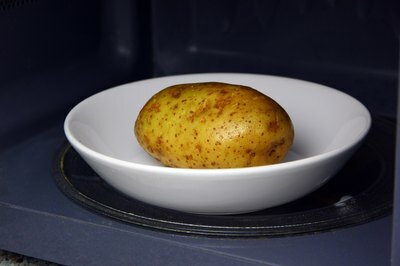 Microwave the potato for another three to five minutes, then gently squeeze the potato to check for doneness. 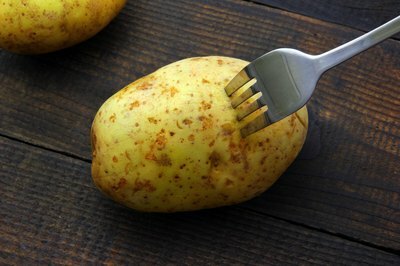 It is done when it is soft to touch and when you can easily insert a knife into the potato. If the potato is not fully cooked, cook on high in one-minute increments until it is finished. One medium-sized potato will be ready in seven to eight minutes. If you are cooking more than one potato, add two minutes per potato for small to medium-sized potatoes. Overcooking a potato on high heat may result in a dry, hard spud. To help preserve the moisture content — and speed up the cooking process — use plastic wrap or a quilted baking bag to keep a potato moist. 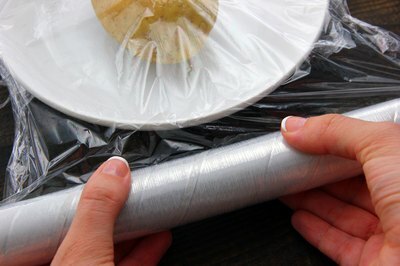 Cover the dish with the potato in plastic wrap, leaving one corner open to allow moisture to escape. Or place non-oiled potatoes in the quilted baking bag before cooking. Microwave as you would uncovered potatoes, but cut off a minute from the expected cooking time.